In just over two years, 120 so-called T-Pods, driverless electric trucks, will travel back and forth between Gothenburg and Helsingborg. ”We have just signed an agreement with a large customer in the grocery trade,” says Robert Falck, CEO of Einride, which operates the system. At Logistics & Transport, he tells more about the step into the future. These transport solutions of the future will be visible evidence under Logistics & Transport at the Swedish Exhibition and Congress Centre 7th-8th of November in Gothenburg. The company Einride was formed just a year ago, but is already drawing on the map. 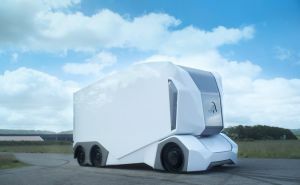 With its T-Pod, a remote-controlled lorry – driverless and power-driven – it opens for more efficient, profitable and environmentally-friendly transport. CEO Robert Falck, with a background from Volvo, sees huge opportunities. Already in November this year, Einride begins its first installation. It’s about three T-Pods to be used internally, in a business area. In short, Einride submits an application to the Swedish Transport Agency for permission to drive on public roads, which is expected to be possible in spring 2018. ”Our goal is to have 200 pods in traffic on the Gothenburg-Helsingborg route,” says Robert. ”Already, we have coverage for 120 T-Pods, through an agreement we recently signed with one of the largest companies in the grocery trade. ”Only on this route we save carbon dioxide emissions corresponding to 400,000 single journeys by car for a year. The T-Pod system has become internationally acclaimed. ”We have received global recognition for our concept. It has been written around 1,800 articles, including a health page in the Washington Post, and we have been nominated for the Edison Awards in the United States, ”said Robert. At Logistics & Transport in November 2017, Robert Falck tells more about the transport solution. Of course, a T-Pod will be displayed in the exhibition. – We hope to find the right audience at the fair. The ambition is, of course, that more people will be interested in our concept.